President of the Union of Hebrew Congregations of Rumania; born in Jassy, Rumania, Oct., 1846. 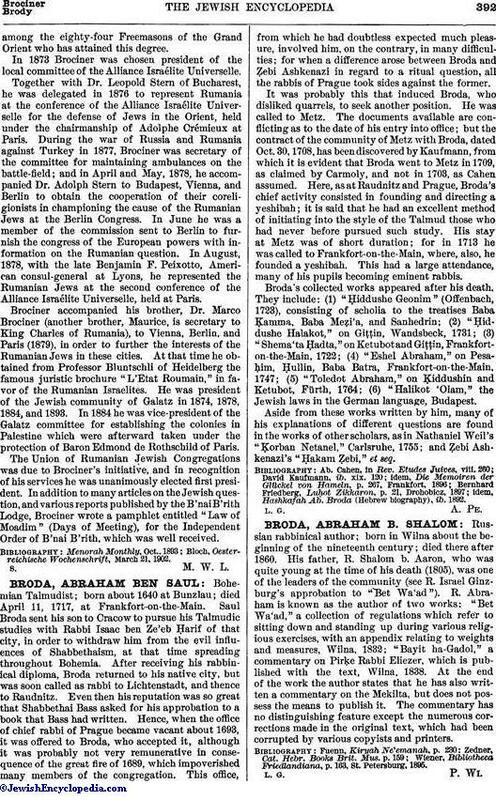 From 1864 to 1866 he studied law at the university of his native city, and during that time cooperated with Dr. Landesberg and others in founding the Unimea Israelita, a Jewish defensive publication society. In 1867 Brociner settled at Galatz as a merchant. He joined (1868) the Galatz Lodge of the Masonic Order (Grand Orient de France), and as a Freemason was active in bringing about a modification of rituals, finally obtaining for himself the thirty-third degree. Up to the present time (1902) he is the only Jewamong the eighty-four Freemasons of the Grand Orient who has attained this degree. In 1873 Brociner was chosen president of the local committee of the Alliance Israélite Universelle. Together with Dr. Leopold Stern of Bucharest, he was delegated in 1876 to represent Rumania at the conference of the Alliance Israélite Universelle for the defense of Jews in the Orient, held under the chairmanship of Adolphe Crémieux at Paris. During the war of Russia and Rumania against Turkey in 1877, Brociner was secretary of the committee for maintaining ambulances on the battle-field; and in April and May, 1878, he accompanied Dr. Adolph Stern to Budapest, Vienna, and Berlin to obtain the cooperation of their coreligionists in championing the cause of the Rumanian Jews at the Berlin Congress. In June he was a member of the commission sent to Berlin to furnish the congress of the European powers with information on the Rumanian question. In August, 1878, with the late Benjamin F. Peixotto, American consul-general at Lyons, he represented the Rumanian Jews at the second conference of the Alliance Israélite Universelle, held at Paris. 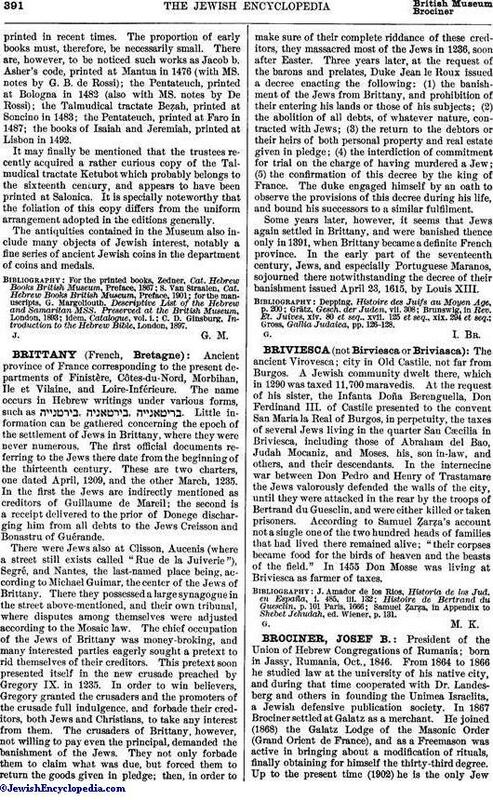 Brociner accompanied his brother, Dr. Marco Brociner (another brother, Maurice, is secretary to King Charles of Rumania), to Vienna, Berlin, and Paris (1879), in order to further the interests of the Rumanian Jews in these cities. At that time he obtained from Professor Bluntschli of Heidelberg the famous juristic brochure "L'Etat Roumain," in favor of the Rumanian Israelites. He was president of the Jewish community of Galatz in 1874, 1878, 1884, and 1893. In 1884 he was vice-president of the Galatz committee for establishing the colonies in Palestine which were afterward taken under the protection of Baron Edmond de Rothschild of Paris. The Union of Rumanian Jewish Congregations was due to Brociner's initiative, and in recognition of his services he was unanimously elected first president. In addition to many articles on the Jewish question, and various reports published by the B'nai B'rith Lodge, Brociner wrote a pamphlet entitled "Law of Moadim" (Days of Meeting), for the Independent Order of B'nai B'rith, which was well received. Bloch, Oesterreichische Wochenschrift, March 21, 1902.